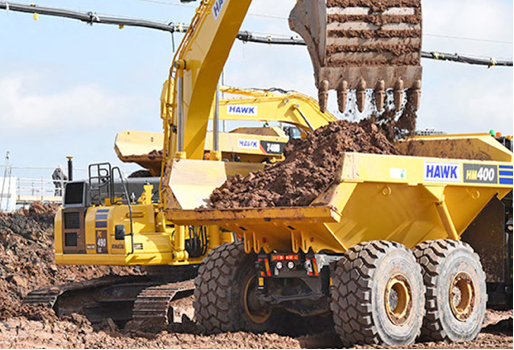 A Caterpillar truck led the bidding as the equipment fleet of Hawk Plant UK raised nearly £29m at auction last week. The sale of all 2,000+ assets of the company which went into administration in January drew big crowds and interest from around the world before ending with a final hammer total of £28,967,840. The fleet was made up of more than 2,000 items. Euro Auctions conducted the sale and described it as “an extraordinary opportunity to see a large complement of well-maintained, late years machinery”. The event also featured the largest collection of John Deere tractors and agricultural machinery to be auctioned in the UK. First day at the Hawk depot at Prees Green, Shropshire was devoted to agricultural machinery and light equipment day while the heavy kit went on sale the following day at an industrial park in Whitchurch. Highest bid of £177,500 was on a 2016 Cat 730C2EJ 6×6 with ejector, with a 2013 Powerscreen 1000 Matrix tracked cone crusher close behind at £170,000. Other high earners included Cat and Komatsu excavators, a Komatsu dumptruck and a JCB telehandler. The main inventory also featured mixed plant such as crushers, rollers, wheeled loaders and dozers, buckets and small tools. The agricultural fleet included 130 mainly John Deere tractors – two attracting bids of more than £100,000 – 80 trailers and more than 70 telehandlers, mostly JCBs.